Bariatric procedures are proven treatment for morbid obesity and its related diseases. Sleeve gastrectomy, which is the first stage of Duodenal Switch, is now one of the most effective and popular bariatric surgeries used worldwide on its own. Performed laparoscopically, 80% of the stomach is removed to restrict food intake and decrease hunger hormones. Patient’s set-point is changed after surgery, their appetite is reduced, their metabolism goes up and starts burning fat. Gastric sleeve surgery is relatively a safe procedure and does not result in a significant nutritional deficiency. This procedure also helps improve comorbidities such as type II diabetes, hypertension, osteoarthritis, etc. Heartburn, Acid reflux, and GERD terms are used interchangeably; although closely related they do not necessarily mean the same thing. Heartburn is a mild to severe pain in the chest caused by the acid irritating delicate lining of the esophagus (food pipe) — the tube that connects the throat and stomach. Heartburn is common and is sometimes mistaken for heart attack pain. Heartburn usually occurs after eating and it gets worse when bending over or lying down. Lifestyle changes, like losing excess weight, eating smaller meals, and avoiding alcohol, nicotine, and fried or fatty foods can help reduce heartburn. If the circular muscle that joins the esophagus and stomach, Lower Esophageal Sphincter (LES), does not close properly, the stomach content flows backward into the esophagus. This is known as Acid reflux. Acid reflux can cause heartburn and other symptoms, such as sour taste in the mouth and bitter taste in the back of the throat. Occasional acid reflux can be treated with over-the-counter medication, antacids such as Tums, H-2-receptor blockers such as Tagamet HB or Pepcid AC, Proton pump inhibitors such as Prilosec OTC (Omeprazole). Acid reflux may progress to a more severe form of reflux, called Gastroesophageal Reflux Disease (GERD). One of the conditions associated with obesity is heartburn or GERD. Heartburn is caused by acid reflux from the stomach into the esophagus due to an incompetent Lower Esophageal Sphincter. GERD causes burning sensation and pain in the chest area similar to heart attack. Individuals with this problem have regurgitation of food, feel a sour taste in the mouth, nausea, vomiting, difficulty swallowing, coughing, wheezing, and chest pain. It has been shown that this condition has a higher occurrence in patients with higher BMI. GERD may be treated with surgery or other procedures, such as Nissen Fundoplication. 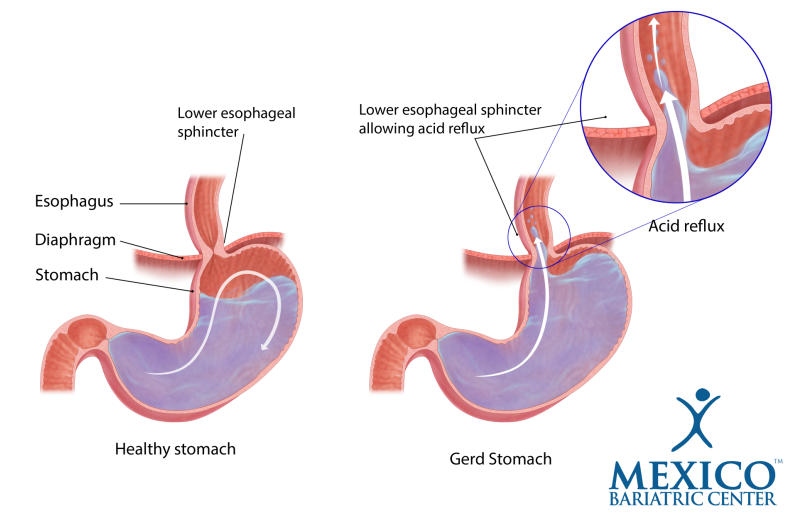 Nissen Fundoplication procedure, where stomach fundus is sewn in position all around the lower esophagus, is used to treat reflux. For the gastric sleeve procedure to be possible, a fundoplication must be dismantled before the sleeve is created. Hernia – When an internal body part protrudes into an area where it doesn’t belong. Hiatus – Is an opening in the muscular wall separating the chest cavity from the abdomen, called diaphragm. Hiatal hernia (hiatus hernia) occurs when the upper part of the stomach called the fundus bulges up through the hiatus into the chest. Patients with GERD may also have a hiatal hernia. The pressure in the abdomen caused by obesity can cause hiatal hernia – pressure pushes the stomach through the diaphragm. The formation of hiatal hernia also causes Lower Esophageal Sphincter incompetence and gastroesophageal reflux. After gastric sleeve surgery, the intra-abdominal pressure and acid production are reduced. On the other hand, the stomach size is reduced and the pressure within the stomach increases. This may cause reflux of acidic content of stomach into the esophagus. Gastric sleeve may worsen GERD symptoms or develop GERD in some patients. It is reported that gastric sleeve induces GERD in 9% of patients. The surgeon’s technique and experience may affect the LES tone and outcome. Studies show that if the patient has a competent Lower Esophageal Sphincter, GERD is oftentimes improved after gastric sleeve. If the heartburn problem persists and is severe a gastric sleeve revision to RNY bypass is necessary. Laparoscopic Roux-en-Y gastric bypass patients show less of a problem with GERD. Gastric sleeve may not be a good option for patients with GERD and individuals with risk of developing heartburn problem may have to opt for other forms of bariatric surgery. Duodenal Switch is very similar to gastric sleeve in relation to GERD and patients experiencing heartburn.